Mixed at the Sol Studios, Berkshire. 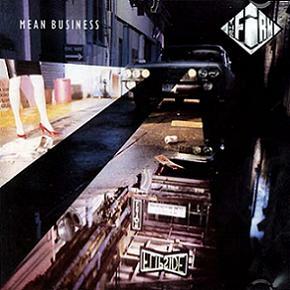 Mean Business is a studio album by the Firm, released by Atlantic Records on 3 February 1986. ‘ Jimmy [Page] had been off the road and was very keen to get back, so we kind of compromised and said we'll make two albums and tour with them and see how we feel at the end of that time. At the end of the two years it was 'Okay, well, that was great, let's move on. The album peaked at #22 on the Billboard's Billboard 200 album chart and #46 on the UK Album Chart, and the single 'All the King's Horses' spent four weeks at the top of Billboard's Mainstream Rock Tracks chart. Same track listing and order as the vinyl release. ↑ Rosen, Steven (2001). Free at Last: The Story of Free and Bad Company. London: SAF Publishing, 122. ISBN 0-946719-74-8. ↑ The Billboard 200 - 15 March 1986. Billboard. Retrieved on 2009-01-17. ↑ RPM Albums Chart - 29 March 1986. RPM. Retrieved on 2009-01-17. ↑ Top 60 Albums - 2 April 1986. swedishcharts.com. Retrieved on 2009-01-17. ↑ Top 100 Albums - 5 April 1986. chartstats.com. Retrieved on 2009-01-19. ↑ Hot Mainstream Rock Tracks - 22 February 1986. Billboard. Retrieved on 2009-01-19. ↑ Hot 100 Chart - 22 March 1986. Billboard. Retrieved on 2009-01-19. ↑ Top 100 Singles - 22 March 1986. Cash Box. Retrieved on 2009-01-19. ↑ Hot Mainstream Rock Tracks - 5 April 1986. Billboard. Retrieved on 2009-01-15. This page was last modified 22:58, 5 January 2014.